You can buy a complete set of swing chair with stand, or you can buy a single stand and a compatible hanging chair separately. That being said, the question that comes to mind here is, why would you need a stand. 1 WHY A HANGING CHAIR WITH STAND? WHY A HANGING CHAIR WITH STAND? A lot of people out there hang their chairs from a tree, or from a beam on the porch or deck. But when you don’t have a perfect overhead place to hang it off and you can’t find that perfectly spaced tree branch, or if you just want to be mobile and chase the sun, a hanging chair stand is exactly what you need. It’s easy to set up and can be fantastic backyard decor. With a stand, you can let your creativity work for you here. No doubt, your backyard is an awesome hanging chair location, but it is not the craziest of all hanging chair ideas. A hanging chair stand can take you and your chair to places like right by your pool, next to your barbecue while you cook, in the sun on your balcony whilst reading and drinking your iced coffee or even indoors, next to the fireplace in your living room. About how to attach a hanging chair to the ceiling, you can read here. But if the ceiling in your room is not suitable to wear it, or if you are unsure of whether it is strong enough, a hanging chair stand is the perfect solution for hanging your hammock or swing chair indoors. 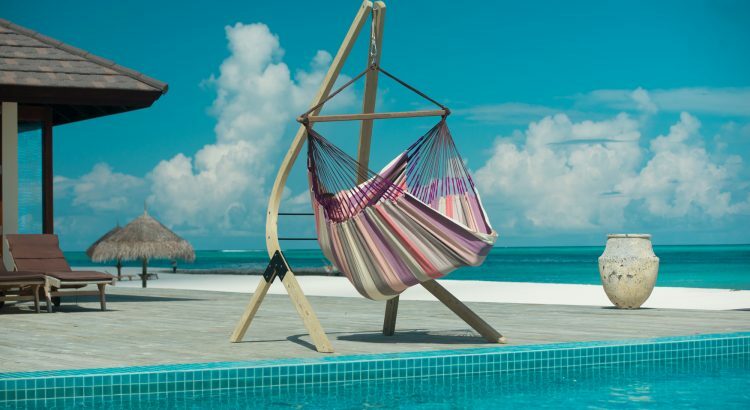 Also if you prefer the option of moving your swing chair around our out of the way when you need to use your space for other activities, a portable hammock chair stand is a choice with no regrets. You may choose from two different variations of stands – those made of wood and those made of steel. Both materials provide stability as well as optimal freedom of movement. So it is largely down to personal taste which one you choose. The most important factor is the capacity. This expresses how much weight you can hang safely on the frame, which means your body weight + the weight of the hanging chair. So if you have kids, or want to enjoy the romantic hammock chair evenings with your partner, you should definitely choose a frame with a correspondingly generous load capacity. A second important factor is the height of the frame. For most hanging chairs is a suspension height of at least 215 cm (7 ft 1 in) recommended. So if you want to use your hanging chair outdoors the rule is- The higher the better. If the frame is too high, you can extend the hanging chair with a chain, a rope or a hammock chair spring easily.For indoor use, you should make sure that the frame fits into space. Many powder-coated steel frames are adjustable so that they fit into any room. The weight of the hanging chair frame is especially important if you want to be flexible and move your swing chair around. If not- a heavier and robust stand is a better choice. Many hanging chair stands need plenty of floor space, especially those ones made of wood. So if you need a stand for indoor use, or for a small balcony, it is very important to measure your available space before you buy a stand. Let’s be honest: a hanging chair stand is not a small piece of furniture that could be overseen. So you will need to keep an eye on how it fits into the overall picture of the room, the balcony or the garden. With a wooden hanging chair with stand, you cannot go wrong.